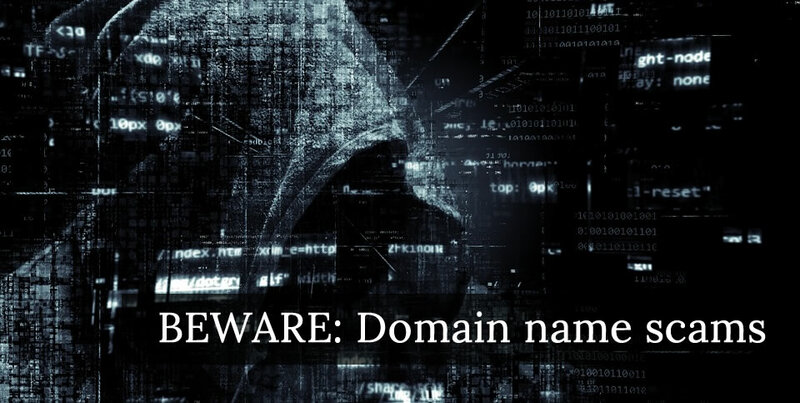 Domain name scams by email are almost as old as the internet itself, but some are really doing their best to look legitimate! Read on to find out how to stay clear of these scams. 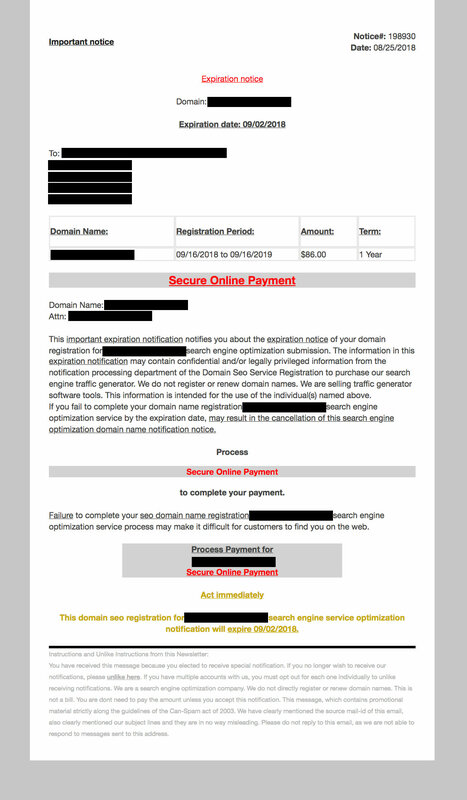 Please see below a scam email we recently received, relating to a client's domain name. I've blanked out with black lines the clients information for confidentiality. If, like us, you understand how domain names work, then by reading the small print you can see from miles away that this isn't a genuine email. If you pay these guys money, you are literally paying for nothing. They use confusing and misleading terminology to make it look genuine, but that's it. 1) Did you receive it from the people you normally pay to renew your domain name? Let's say you registered your domain name with "COMPANY A". Is the email you're receiving from "COMPANY A", or is it from some company you've never heard of? If it's from a company you've never heard of, then it's likely a scam! 2) Did you receive it at the right time of year? Domain names are renewed annually or bi-annually, based on the date the domain name was registered. So let's say you register the domain name my-company-name.com, on 1st Sept 2018. You'll need to renew it around 1st Sept 2019, 1st Sept 2020, 1st Sept 2021, and so on. If you get a renewal reminder around Feb or March time, then obviously it's going to be a scam! 3) Does your domain name renew automatically? Many domain name providers, such as ourselves (we're official domain name registrars), automatically renew your domain name for you and invoice you for it (unless you ask us not to). So with a lot of providers you'll simply get an invoice, rather than a threatening reminder. If in doubt, check with the company you registered your domain name with. Please note we won't be able to advise you unless you're a client of ours. "I created a new brand which consists of some really unique products and I needed a simple & clean website to start getting 'In the Bright Garden' seen. The website I've got through uporium allows me to showcase and sell my products on a great looking theme, which is really easy to maintain and update. After conducting extensive research into the best platform for my online store I found Uporium not only to be great value for money but they also back it up with great customer service, and a platform that is user friendly. Being user friendly was the most important factor for me, as other platforms were far too difficult to operate and understand and didn't offer the fantastic service that Uporium have provided to me."